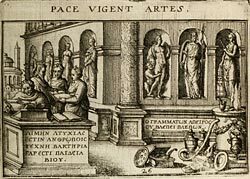 French Emblems: Emblem: PACE VIGENT ARTES. PACE VIGENT ARTES. PAce vigent artes: aras pax thure vaporat. Pax cererem & Bacchum promovet atque fovet. Dispensat: placida pace beatus homo est. Arts flourish in peacetime: peace heats the altars with incense. Peace promotes and nurtures Ceres and Bacchus. She is the daughter of Jupiter and dispenses to us the rewards of the gods. When he has calm peace, man is blessed. 1. The same Posthius as in Emblem 16. 2. The Greek texts in the pictura come from Menander, Sententiae (Jaekel edition, 1964), Monosticha, 430 and 122. 3. For Ceres and Bacchus as bringers of corn and wine, cf. Alciato, 1584, ‘Omnia mea mecum porto’([FALc037]).